When a spouse becomes ill, the well spouse is suddenly faced not only with the emotional toll, but the burden of handling all the financial responsibilities and long-term planning on his or her own. If the ill spouse always handled the financial matters, even paying bills can be overwhelming. Based on the experiences of many of our clients, it has traditionally been the primary breadwinner who managed family finances. But regardless of who kept the family books, often the other spouse is in the dark on the family’s financial matters and record keeping. Additionally, the well spouse may not know what long-term planning considerations have been made for her or what is even available. and long-term care planning burden passes to the spouse who has generally not had to deal with these issues previously. Though not always possible, it is important to be as proactive as you can and review and familiarize yourself with these matters before a spouse becomes ill.
• Any other important items including: the deed to your home, title and registration to automobiles, and safety deposit box. made as to what type of account(s) you have, how much money is in it, how the account(s) is(are) titled (who owns it) and whether there are any beneficiaries. Know what your income is and where it comes from. Does your spouse receive a pension? If so, will it continue if he predeceases you? Do you have any retirement accounts (including IRAs, 401ks, profit sharing plans) that you are required to take minimum distributions from because you have reached the age of 70½? Important resources are available to aid you with this undertaking. Many senior centers offer programs to assist with managing household finances and bills. They also may have volunteers who will review your Medicare coverage with you as well as your medical bills so you understand what you are being charged. If your spouse dealt with the same bank for several years, he may have developed a personal relationship with them and they may work with you to review your accounts. Additionally, an elder law attorney can play a vital role in making this process easier for you. He or she can meet with you either at your home or in the office and go through and explain all of your paperwork with you. If your spouse dies, it is important to contact the Social Security Administration to advise of his death and to make sure you receive all of the benefits to which you may be entitled. You may be eligible for a one-time payment of $255. Also, if you are considered full retirement age for survivor’s benefits, as defined by the Social Security Administration, you can receive Social Security benefits based upon your deceased spouse’s earning record. This can be a significant amount if you either did not work outside of the home or earned less than your spouse during the time you were employed. It is important to know that your full retirement age for retirement benefits may be different from your full retirement age for survivor’s benefits. Also, if you are receiving survivor’s benefits you can switch to your own retirement benefit if your retirement rate is higher than the rate you are receiving for survivor’s benefits. The rules are complicated, and, therefore, it is important that you carefully consider all your options before making a final decision. You need to understand what type of health insurance coverage you have, including Medicare. If you have Medicare, review whether you have Part A, Part B and/or Part D. Also, if you and your spouse have a retiree health plan through your spouse’s former employer, does it continue if your spouse predeceases you? If it does not, you may be eligible for COBRA. COBRA is federal legislation that allows former employees, retirees, spouses and dependent children to temporarily continue group health coverage that would otherwise be terminated. If you are covered by both Medicare and a group health plan as part of your spouse’s retirement and your husband dies, then you may have the right to elect COBRA continuation coverage with respect to the group health coverage for the maximum period of coverage available (18 to 36 months). If you become covered by Medicare at any time after an election of COBRA continuation coverage your COBRA continuation coverage will probably end. It is important to know that you only have 60 days from the date of your spouse’s death to elect COBRA coverage so action must be taken promptly. Also, COBRA coverage can be very expensive (i.e., employer can charge up to 102 percent of the employer premium). The additional 2 percent is designed to cover administrative costs. Long-term care is not limited to nursing homes. Today, most care is received at home and it is important for you to understand what options you have available to you and your spouse. Review whether you have long term care insurance and what coverage it provides. It is important to familiarize yourself with the differences between Medicare and Medicaid and what each program can offer you. Geriatric care managers are available to assist you with care planning assessments and provide solutions to your individual long term care needs. If possible, it is important to review, understand and work on these issues. The more familiar you are with these responsibilities, the more comfortable you will become with them and less fearful of handling them on your own. It will help ease your burden and provide peace of mind so most of your attention can be paid to your ill spouse. 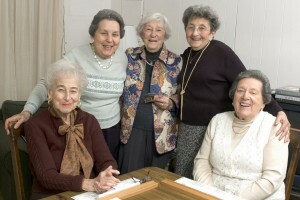 To learn more about New York elder law, New York Estate Planning, NY Elder, and New York Special Needs Planning, visit LittmanKrooks.com.